If you have read my previous posts I am a granola bar addict. But after adjusting my favorite recipe, and trying new recipes I became just plain bored. I wanted more of a challenge. I also wanted something raw, with no oats. Time to tackle a Kind bar. I wanted nothing but nuts and berries. I wanted to live like the squirrels do. Not so much. But I wanted some pure nutty goodness full of fruit and chia seeds. I also hate peanut butter, so I had to create something that will stick together without it. Upon research I found that although honey is pretty damn sticky it ain't going to keep your nuts together (some might beg to differ ;-) !). I came across only a couple of recipes that peaked my interest. The common 'bond' between them was brown rice syrup. This will act as your glue, and it also hardens after a small stint in the oven and a cooling process. Of course I can't leave well enough alone and I had to change my ingredients and make it my own. I just can't follow directions, even if it's the first time, and I should try the recipe first. Nope. Won't do it. I am always inspired when I go through the bulk areas of the natural store. I just want to get everything, fill up baggies of things that I don't know how to use. Then come home and do lot's research. I am aces when it comes to that BTW. There is never a reason to not know something. But this once 'created for research inter-webby-net thingie' tool is now a free-for-all-of -f*#k all! I think that adds a bigger challenge of learning how to weed through the crap, and know who is just a freaking whack-a-do (but that too is fun!). 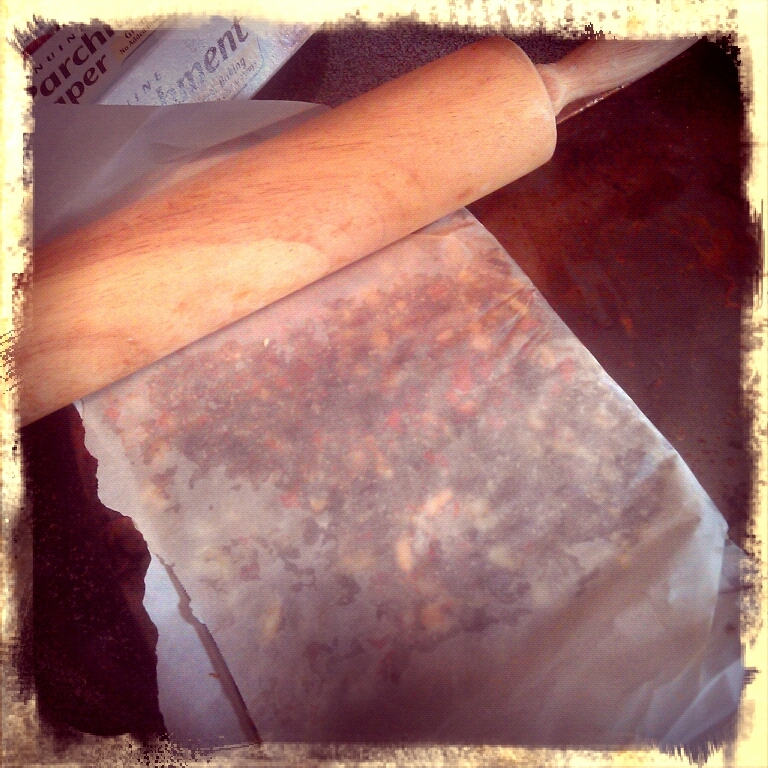 I did not chop my nuts, I lightly rolled them over with my rolling pin under parchment paper. I wanted them no smaller than halved. They just look better in the bar. Recently I wanted to take my granola bars and un-granola them. I wanted to use whole nuts, berries, seeds, and no flour. But how to stick it all together? My friends; Brown Rice Syrup is the answer. I was able to find one recipe that engaged me, and of course I mixed it up to suite the things I like. 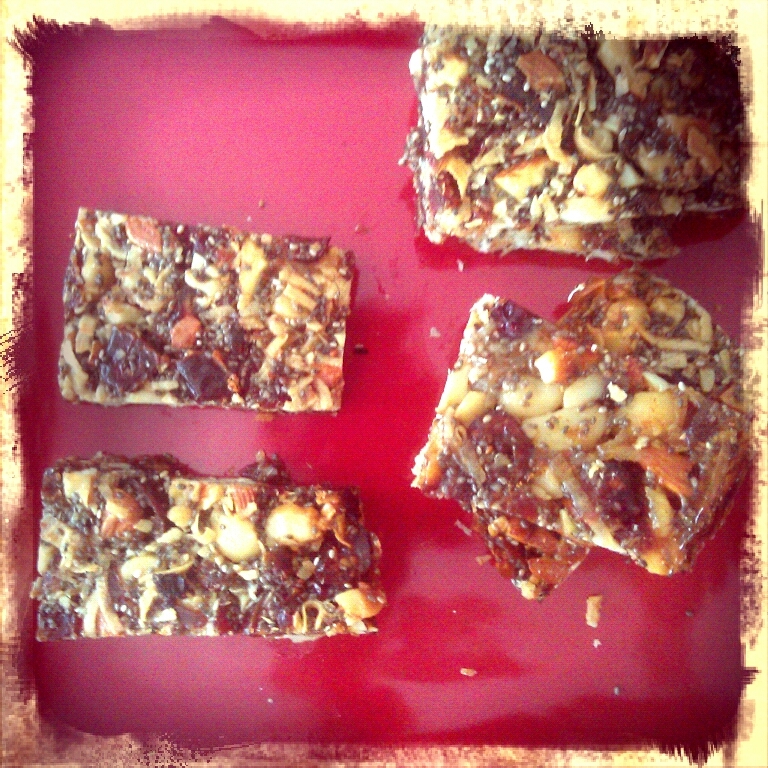 Or now try my no bake Lara Bar recipe! Done in minutes. 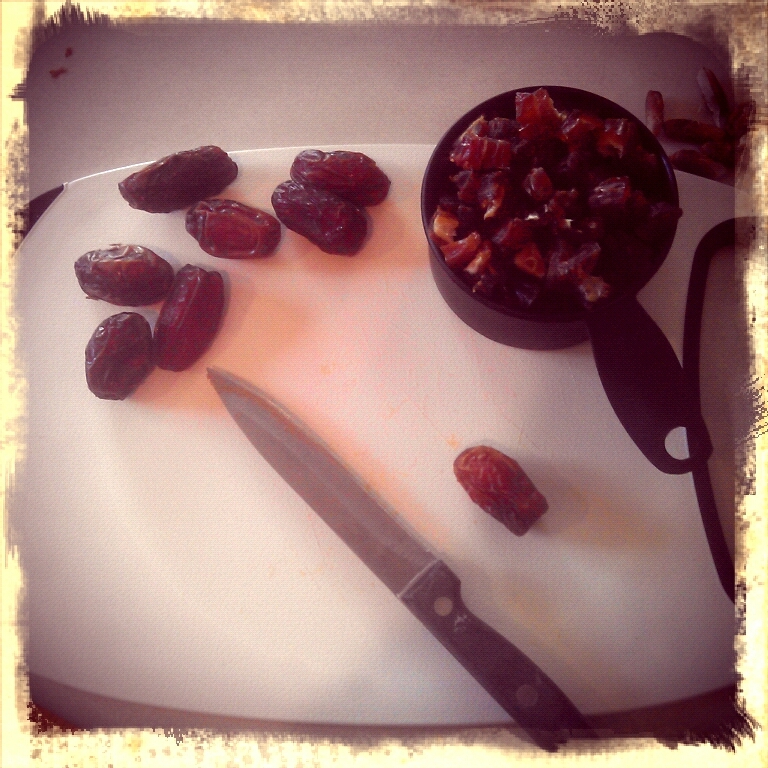 Chopping and pitting dates was a hard task... so sticky and sweet. Yummy. ( I did not do this step, I just don't like the taste of toasty nuts)Scoop the chopped raw nuts and seeds onto a 1/4 sheet pan (9×13), and toast for 15 minutes, stirring at the 7 minute mark, to ensure the nuts don t burn. Add the coconut flakes when you stir. 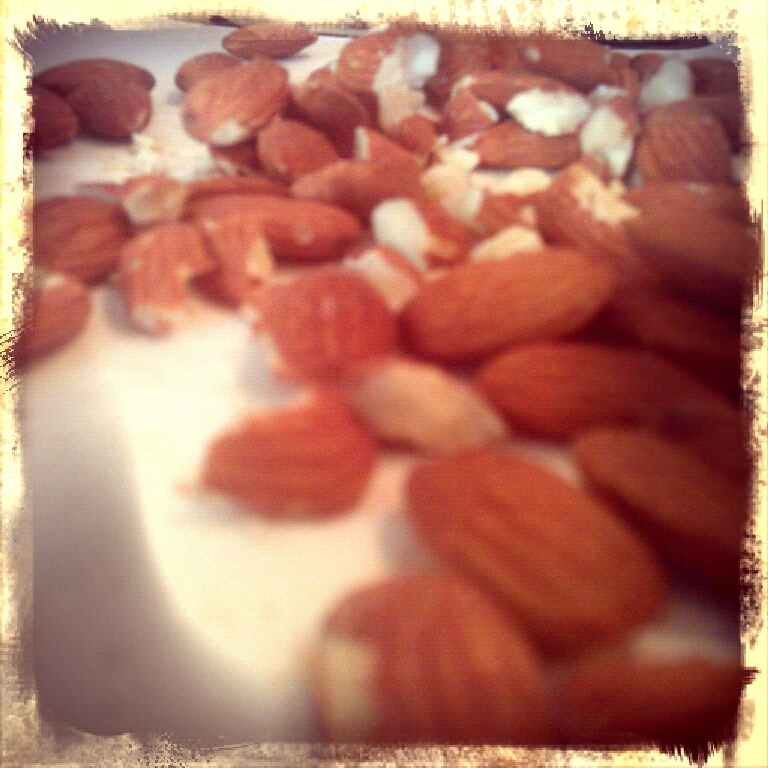 When the nuts are toasted, scoop them into a medium mixing bowl. Add the minced dried fruit and stir together. Pour the brown rice syrup, honey, salt, pinch of cinnamon and black pepper in a small bowl. Warm in the microwave on the lowest setting for 15-30 seconds to gently heat the syrup to make it easier to stir into the nuts and fruit. Pour the warmed syrup mixture over the nuts, using a spatula to ensure that you get every last drop. Stir the nuts and syrup together. Put a little elbow grease into it to ensure that all the fruit and nuts get an even glossy coating of syrup. Line the sheet pan with parchment paper, and spray with oil. Scoop the nut & fruit mixture onto the lined cookie sheet, and spread with a spatula. Next, spray a second sheet of parchment to cover the bars as you press the mixture firmly into the pan. Peel the top layer of parchment off when done pressing the bars together. Place the bars back in the oven for 15 minutes. Remove the bars from the oven and let cool for 15 minutes, then proceed to cut them while they re still slightly warm. If they fully cool before cutting, they will not slice into neat squares – they will break unevenly into shards. Gently lift the bars out of the pan by the parchment liner, and use a chef knife to slice the bars into squares while still on the parchment – otherwise they will stick. Once cut, use a butter knife to separate the bars from the paper, and store in a container with sheets of parchment between layers to prevent sticking. Store in the fridge for 2-3 weeks. A great way to pack them down is use a rolling pin. That's why I used a cookie sheet. I put mine in the fridge until hardened, I had no problem cutting them. They were a little too sticky to cut if I didn't do so and I didn't want to ruin them. They taste amazing, they are also very filling. The whole nuts where crunchy, the dates and cranberries like fresh sweet burst. And a special treat if you get a corner bit where the brown rice syrup baked it's a tasty crunch treat. I wasn't sure how the brown rice syrup would taste, I am very pleased. It makes an amazing adhesive! 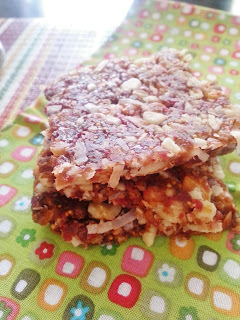 Also see my Lara Bar recipe, no bake, no rice syrup!